Cody (my husband and self-titled creative director ;)) and I have been hard at work on some new creative content, including a brand spankin new YOUTUBE PAGE. You can scroll to the bottom of this post to watch our full video on how we styled these gorgeous culotte pants! Culotte pants are one of those fantastic trends that can either go so right or a little bit wrong IMO. Let's face the facts first: a wide-legged, printed pant is most likely not going to be the most flattering thing you've put on your body. BUT, I think they're so much fun and soo stinking comfortable that they deserve to be in everyone's closet this summer! I chose to show two different ways to style this great floral pair today just to give you a bit of variety. The first look is more of a work-appropriate look (how great is it to feel like you're basically wearing sweatpants at work?!) including a basic white cami, tailored denim jacket, and comfy espadrilles. The second is for my trendy girl who isn't afraid to take a few risks. The culottes are high-waisted so you can get away with a shorter crop top without feeling too exposed. 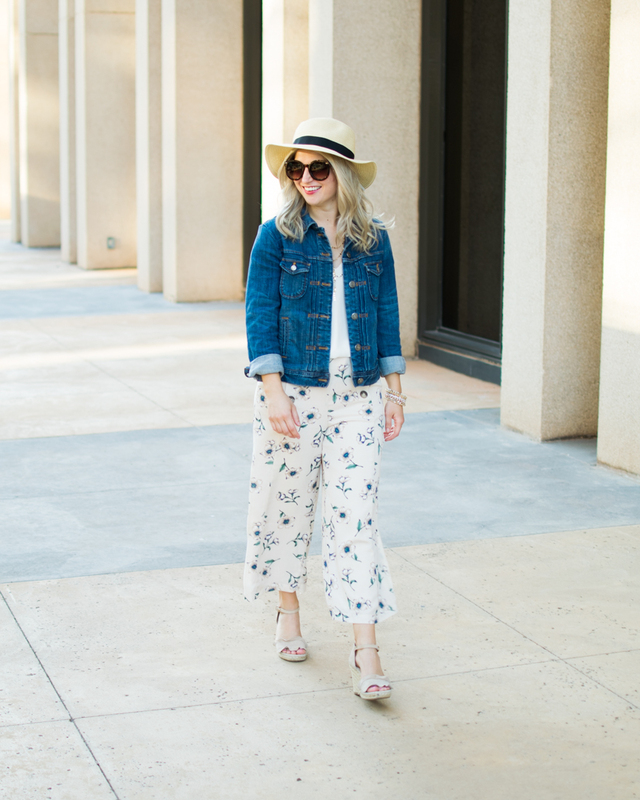 Throw on a fun pair of retro sunnies and strappy heels, and I promise you will feel more hip than your first go-round with that hair crimper in the 6th grade (if you relate to that exact feeling, we are real friends).